A sneak peek of my home… | Fluffyghosts Art & Daily interests. This month is going so fast it’s scary! Ive hardly been able to blink without a huge amount of time flooding by. So December has brought me alot of Freelance work. Hense the lack of posts (Sorry!) but then again im getting really excited about showing you guys what ive been up to & what concoctions ive created in my art studio. Sadly i cannot reveal what ive made till after Christmas…Just incase those people get a little bit nosey! Haha…I’d just hate to ruin a surprise. 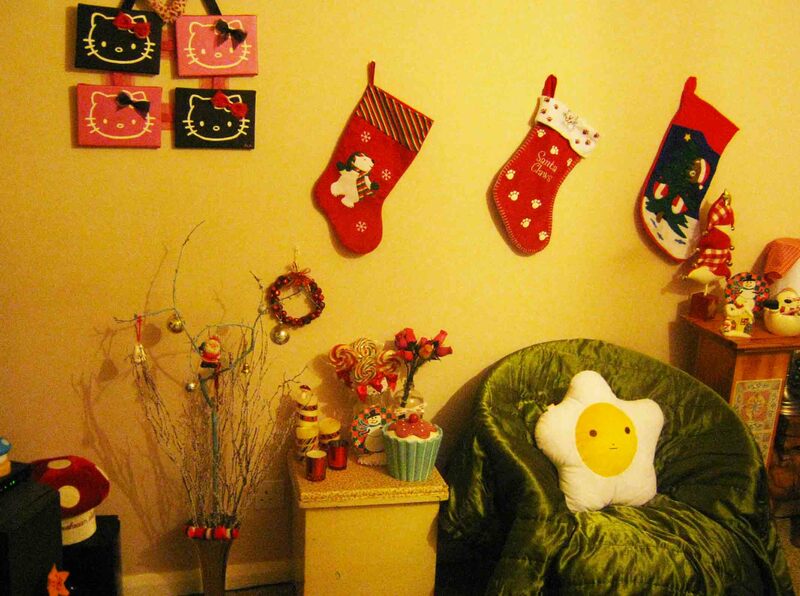 So here is just a couple of photos of my home, in full swing of Christmas. So this is my real tree in my front room, it smells so good! You really can’t bet the smell of a fresh cut Christmas tree! 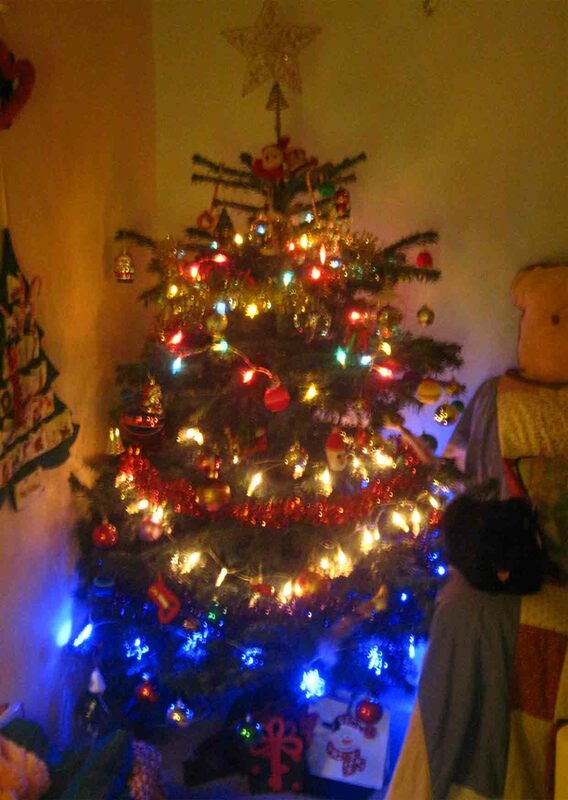 As you can see from my last post, ive had to move the room around alot; just so we could fit the tree in the room. Fun times >….< ! I prefere the way it looks now :3 That’s one of my favourite things about Christmas … The sensation of just everything finally coming together. Ive combined alot of handmade, thrifted, secondhand with some new bit’s i brought. 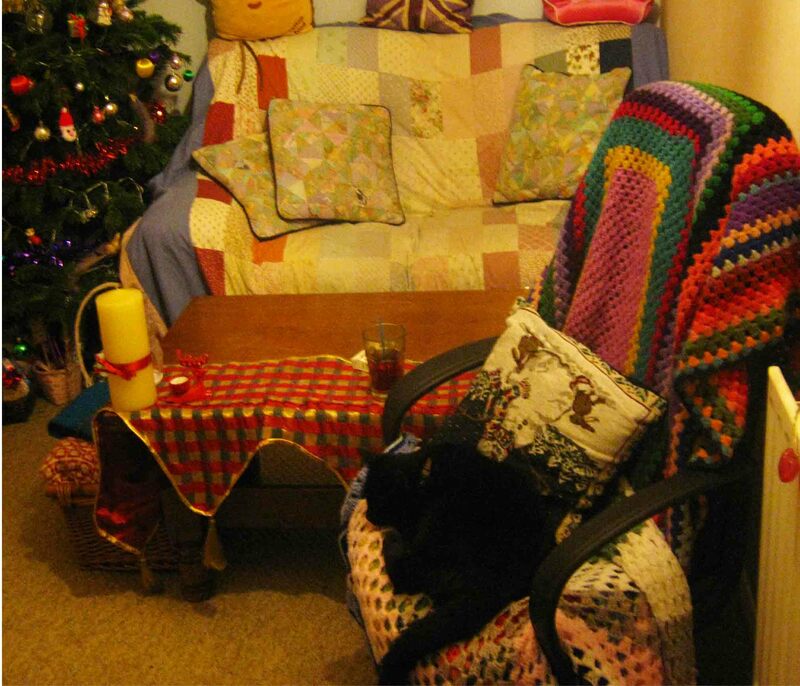 This is one of two of Hewiee’s chairs in the front room. (Other being the green one) Yer i know “why is there an ugly black computer chair in your front room” erm… Stubborn men? Hahah. But it does’nt look to bad with two granny blankets i picked up thrifting a couple of months ago. It’s surprisingly comfy actually, hense why it is now one of Hewiee’s chairs. Silly cat. I love this photo! It’s just Hewiee posing. He looks really majestic to me with all that colour around him. Plus him being black (in the abstract way not racist 😛 ). My kitty is such a cutie . Hows everyone festive season been so far? Ill be back late tonight, or tomorrow with a sweet Christmas token you can make for whoever you want to pass a little bit of the Christmas spirt on to this year. Without busting your bank account in the meanwhile. Woo! 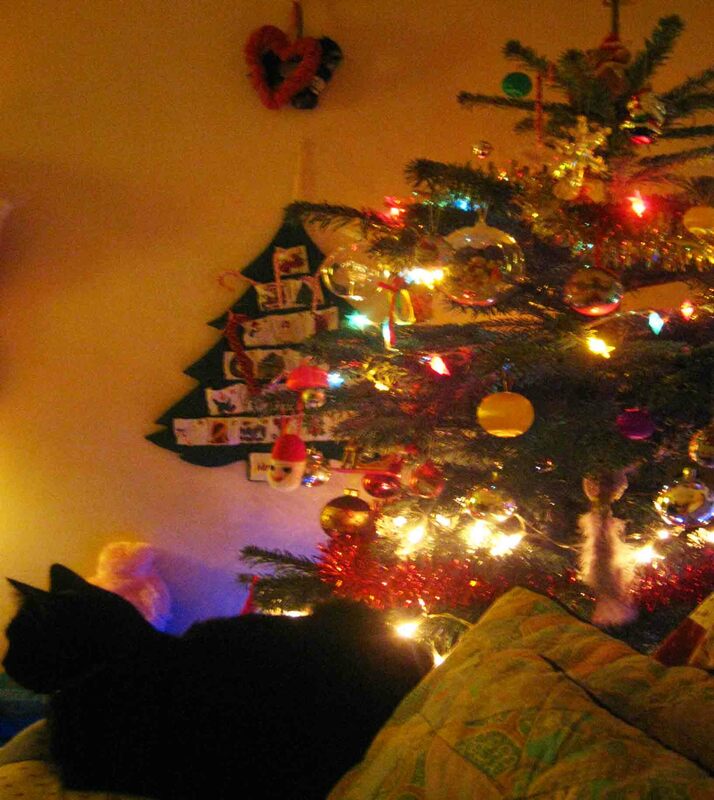 This entry was posted in Cats, Christmas, Home.. Bookmark the permalink.